Are you looking for a skilled Upper Saddle River mason? Need someone to install a new driveway or patio? Everlast Construction & Painting LLC has provided expert masonry services to Upper Saddle River New Jersey residences and business since 2000. Whatever your hardscaping or outdoor living project, Everlast Construction & Painting LLC is can get it done right, the first time. Tell us what you're after, what materials or colors you're envisioning, and we'll come up withe a fair price and timeline to get it done! Is it time to focus on improving the curb appeal of your house? Ready to beautify your outdoor living space? Everlast Construction & Painting LLC provides beautiful, fairly priced masonry solutions for updating and enhancing your home's exterior. Whether it's new entrance steps, a newly installed patio, or an outdoor kitchen installation in Upper Saddle River you're after, Everlast Construction & Painting LLC has the expertise to complete your project on time and to your specifications. Need a quality commercial mason to build or repair brick or stone structures on your business property? Everlast Construction & Painting LLC can handle that too. 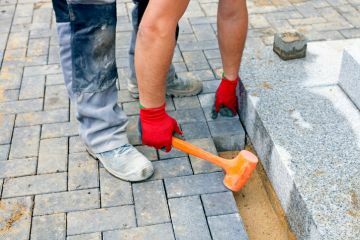 For any Upper Saddle River commercial masonry project, Everlast Construction & Painting LLC provides the manpower and all necessary equipment to complete your project with minimal interruptions to your business operations. Call (973) 333-4540 to learn more. Why Choose Everlast Construction & Painting LLC's Upper Saddle River Masons? Everlast Construction & Painting LLC has become recognized as a caring Upper Saddle River masonry contractor who provides attentive customer service and master mason craftsmanship. No job is too small or large when it comes to our provision masonry services. Since 2000, Everlast Construction & Painting LLC has possessed the passion and expertise to work with you every step of the way build or repair any masonry project on time and within budget. Call (973) 333-4540 to get started!